This is the nineteenth entry of Russia’s Alien Nations: The Secret Identities of Post-Socialism, an ongoing feature on All the Russias, as well as the sixth entry of Chapter 1. It can also be found at russiasaliennations.org. You can also find all the previous entries here. In theory, Homo Sovieticus could have been a neutral term, or even a positive one if it had been adopted voluntarily by the people it purported to describe. Mikhail Geller claimed that he encountered the phrase in a 1974 book called Soviet People (Советские люди), which called the USSR the “fatherland of a new, more advanced type of Homo sapiens: Homo sovieticus.” Moreover, he claims that the term was used in the Soviet Union as part of Latin instruction for future doctors (“Homo sovieticus sum”). Even if this is the case, it’s a rather obscure example. According to Geller, it was the first Latin phrase the medical students learned. That’s all well and good, but it’s also Latin: under what circumstance were they actually supposed to use these words? As a rare reference to the contemporary world in the instruction of a dead language for people who need to be able to understanding their profession’s specialized vocabulary, it doesn’t hold much promise as a transmissible meme, let alone as a term of art for pedagogy or propaganda. Instead, the term makes much more sense historically as a diagnosis from afar, and therefore as a phenomenon that is nearly always presented as negative. It would never catch on all that much in the Soviet Union; Latin words were more likely to seem pretentious than anything else. But the very failure of “Homo Sovieticus” to spread internally among the Soviet population only sets in relief the eventual success of sovok, a much catchier (and native Russian) word whose meaning would overlap with its Latin counterpart quite significantly. Konstantin Bogdanov and Maja Soboleva, among many others, trace the term back to a 1962 study by Joseph Novak (Homo sovieticus, der Mensch unter Hammer und Sichel). Even in early scholarly works that used the phrase to describe a phenomenon that the authors considered negative, the words themselves had yet to become a term of abuse, nor were they on any reasonable path to becoming part of the Russian vocabulary. All that would change with the publication of Alexander Zinoviev’s novel, Homo Soveticus. Zinoviev is one of the more vexing figures of the late Soviet emigration. Though immensely prolific and quite well-known throughout his life, he has been largely forgotten since his death in 2006. This is likely because of the highly tendentious nature of his work, and the impossibility of pigeonholing him into any particular category. The head of Moscow State University’s Logic Department, he was a dissident throughout the 1970s. When his first two satirical novels were published in the West, Zinoviev became persona non grata, and emigrated to Munich in 1978. He continued to write scathing anti-Soviet fiction and nonfiction through the 1980s, but was appalled by Gorbachev and perestroika. In his later writings, he praises Stalin and collectivization while raging against the West. This book is about Soviet Man. He is a new type of man, Homo Sovieticus. We will shorten him to Homosos. I have a dual relationship with this new being: I love him and at the same time I hate him; I respect him and I despise him. I am delighted with him and I am appalled by him. I myself am a Homosos. Therefore I am merciless and cruel when I describe him. Judge us, because you yourselves will be judged by us. Zinoviev, in telling us his attitude towards his chosen subject, is both prefiguring the manner in which the sovok, the Homo Sovieticus’s next iteration, will be handled by his compatriots, and also instructing the reader. I have called this chapter “Soviet Self-Hatred,” a term I stand by, but self-hatred does not have to mean the complete absence of self-love. Homo Sovieticus is meant to prompt both groans of embarrassments and smiles of recognition. Yet even in this preface, the terminology proves to be fraught with meanings intended and unintended. 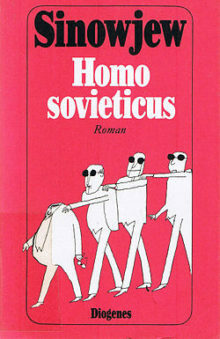 The move from “Soviet Man” to “new type of man” to “Homo Sovieticus” is not just a matter of listing synonyms, but rather of switching both semantic registers and discursive categories. “Soviet Man” could still be a mere placeholder, while “new type of man” evokes the socialist/utopian traditions discussed earlier in this chapter. “Homo Sovieticus” is not just Latin; it’s a biological term that suggests both an evolutionary process and even the rise of separate species. Given the Marxist emphasis on nurture over nature, this is deeply ironic, but considering the Stalin-era conflation of the sociological with the biological (as in the idea of the ‘hereditary proletarian), it is also appropriate in its inappropriateness. The scientism implied by “Homo Sovieticus” is the logical conclusion of the quasi-biological, quasi-anthropological approach to the inhabitants of socialism that is inherent in the phrase “New Man.” No wonder Zinoviev is so happy to appropriate the term as the title of his novel. Literalizing the metaphor of utopian socialist anthropology, it recasts the discourse of social progress as one of speciation.